Tired of going through a collection of gait belts to search the right size to suit a particular patient? Need a reliable gait belt to transfer residents and patients? Check out our high quality reliable universal gait belt that offer maximum ease to the attendant and comfort to the patient. The soft nylon construction of the gait belt offers a range of benefits. It is easy to clean, comfortable for the patient, and will not prone by wearing it, and won't tear even with hard use. Cleaning regularly to maintain the hygiene of the Durable Medical Equipment is made easy because of the machine-washing capability. The transfer belt is fastened firmly and comfortably around the patient's waist with the help of the adjustable quick release buckle. The buckle also allows the medics and caregivers to release the patient immediately from it. 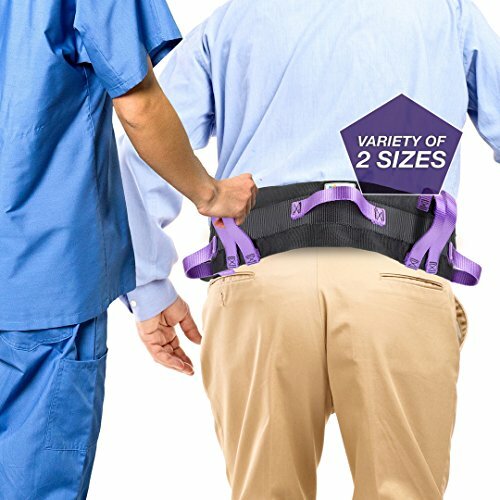 allows attendants to transfer heavier patients without taking a toll on their backs. The 6 horizontal and vertical hand grips help the caregivers to handle the patient in the best orientation by choosing the best leverage point. and prevent back injuries of caregivers. THIS NO.1 GAIT BELT IS JUST A CLICK AWAY FROM BEING YOURS! CLICK ON THE ADD TO CART BUTTON NOW AND GET THIS TRANSFER BELT TO YOUR FACILITY WHILE STOCKS LAST. HIGH QUALITY STRONG CONSTRUCTION - This gait belt is made of durable high quality super soft nylon, which is machine washable. Invest on this premium gait transfer belt that will last for years to come. SUPERIOR COMFORT FOR THE PATIENT - The 4" high back construction facilitates greater weight bearing allowing medical staff to transfer heavier patients without causing any discomfort to him or her. Gait Belt for Nursing, a must have in every clinic, hospital, hospice, and ambulance. 6 HAND GRIPS FOR EASY AMBULATION - 6 handles firmly sewn vertically and horizontally to the gait belt facilitates easy ambulation of the patient using the best leverage point. No more back pains for caregivers and attendants. ONE GAIT BELT FOR ALL - The universal sizing of the belt makes this useful to transfer patients of all age groups and weight ranges. Invest once on a gait belt for all the patients under your care. This transfer belt is one of the most reliable and cost effective options in the market. If you have any questions about this product by "Trademark Supplies", contact us by completing and submitting the form below. If you are looking for a specif part number, please include it with your message.